Who cares about those protesters, and their nickel and dime boycott? WE WILL NEVER FORGET!! Now this is the Democrat narrative. These imbeciles, terror supporters, get to say anything they want, and calling them out on it is victimizing them! These creatures are disgrace to humanity. The community needs to notify all of our Democrats that are in office that this is reprehensible, and will get our response at the ballot box. Tell Nadler that the support from the Jewish community is zero. Same for the others. I wish them speedy retirement. Let them boycott this country and get the hell out of here and back to their hell hole. I love America. Where Yemeni-Americans can own bodegas that boycott a newspaper owned by an Australian-American. there are no Yemeni Americans, they are Arabs, simple, just like there are no so called Israeli arabs, they too are Arabs, there are no so called Palestinians they are arabs. parah adom. I love america too, where we can say: "Here is your something" (9//11) or here is your "Fine People" Nazis marching and chanting "Yews will not replace us"
The Post, New York Time, Wall Street Journal is not endangering the Muslim community, Omar is-get it right-Omar's words were quoted. Bann together and be vocal about the harm Omar is doing to her own community. She was dismissive and disrespectful of what HER Muslim brothers brought to the United States. She should not be a member of congress. Listen up you obnoxious rasha! Are there any Jewish Americans? Take your Hitler-inspired dementia and keep it in your vile head. "Some people did something " - is a statement reflective of a mindset. 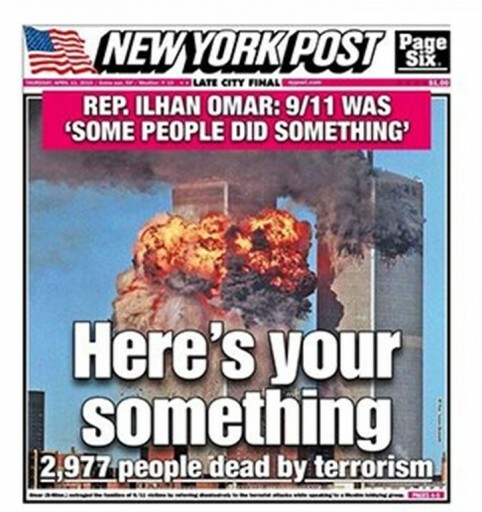 The murder of nearly 3000 fellow citizens is heinous enough- but when put into context of a complaint over the reactive anti-Islamic sentiments created therefrom, it demonstrates Omar's identity as a minority first and an American secondarily. The boycott is further demonstration of prioritizing the community over national interests. Therein lies the danger of Democrats prioritizing politics overs national security. Fake news. Noone ever called those chanting jews will noi replace us fine people. Its a lie that you keep on repeating. Our president did say that there were innocent people among the crowd protesting the Lee statue removal, not aware of the nazis present and not part of that chant. They were fine people. Short & simple, Omar and Rashid are both well planted moles! The amazing thing is that she condems the non-existent dual allegiance of Jews, while at the same time aligning herself,100% with radical Islamic organizations, like CAIR. You’re on the side of the anti semites and you call him a rasha? Wow that’s rich! I still dont get the logic of the Yemeni bodega owners. The NY post is just explaining what Omar conveniently left out. The article headline is a disservice to the reality. Its nothing to do with Yemen, but is specific to Muslims. It wasnt Yemenis who attacked on 9/11, it was Muslims. Omar, speaking to CAIR seems to have conveniently forgotten that, and dismissive of the responsibility that it constantly holds to denounce terrorism. "Because here’s the truth — here’s the truth: Far too long, we have lived with the discomfort of being a second-class citizen, and frankly, I’m tired of it, and every single Muslim in this country should be tired of it. CAIR was founded after 9/11 because they recognized that some people did something and that all of us were starting to lose access to our civil liberties." Maybe you should try to tell them they are not Yemeni Americans. I am sure you can set them straight. Maybe you should pass out pamphlets on the street or something.